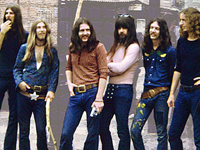 Southern rock veterans Black Oak Arkansas never quite achieved the level of success enjoyed by contemporaries like Lynyrd Skynyrd and the Allman Brothers, but have remained a cult band thanks to their raw, primitive energy and the testosterone-fueled antics of lead vocalist/showman James “Big Jim Dandy” Mangrum. Named for Mangrum’s hometown, Black Oak Arkansas eventually built up a solid following through incessant touring and enjoyed a run of ten charting albums between 1971 and 1976. The band also found itself with a Top 30 single in their raunchy cover of a LaVern Baker R&B hit called “Jim Dandy to the Rescue,” which became Mangrum’s signature song. When album sales dried up, Mangrum re-formed the band with more musically skilled veteran players and continued to tour, although the group’s glory days were past.